In my last post I published a map made in the black and white city style from the 2010 annual. As I said in that post I am very fond of black and white maps and the style is both fun to work with and have a nice selection of buildings. However I think that the end result is a bit to white. Sometimes, if you have large white areas in the map the white tend to be a bit dazing. To fix this I like to add some texture to my Black and white maps. This will turn down the white areas in them. 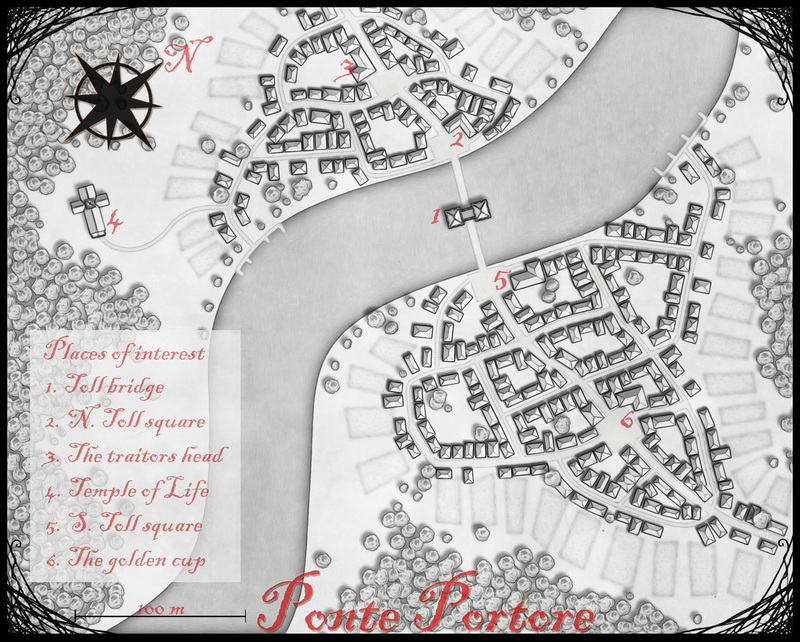 If you look at the picture below you will see a part of my Ponte Portore map, as it comes out of City Designer 3. As you can see in the picture the white areas are very white, at least I think so. To tone down the white I open up the map in Photoshop. In Photoshop I’m going to add a new layer with a texture, in this case I’m adding a paper texture by Coyotemax that I’ve acquired over at the cartographers guild. 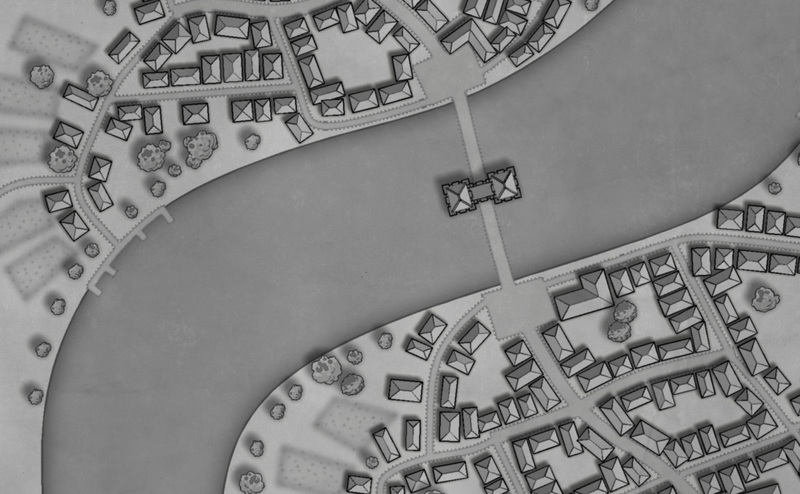 Because this is a Black and white map I’m converting the coloured texture into black and white. The layer should be on top of the actual map layer. Now you will only see the texture. Change the layer setting from normal to multiply. This will let you see the map layer through the texture layer. The result will look something like the picture below. As you can see it will make the whole map very dark, too dark actually. So we have to fix that. Create a new adjustment layer, Curves…. This layer should be the top layer in the map. With Curves you can adjust the light in the picture. You do this by changing the vertical line in the curves settings window. If you get too much light in the picture, don’t worry. You can easily fix that with the adjustment layers opacity setting. After having done this the picture will look something like the example below. As you can see in the picture the white is now toned down and you have a nice texture in the map. I actually use some sort of texture in nearly all my maps. By doing that you get more of a feeling that the map is hand painted. An that is usually the feeling I’m after. I’ve always been very fond of black and white maps, especially black and white city maps. The reason for this is probably the roleplaying games I played when I grew up. I do still pick up the old adventure books from time to time to look at the maps. Whenever I read new material I always first look at the maps. If the maps are bad I wont buy the product. It’s like with music, a bad drummer (I do play the drums myself) or singer and the band is soon forgot. In this particular map I used the April Black and White city style from Profantsy’s 2010 Annual. I did however decide to change the default colour of the text to red, from black. I think that red text on black and white maps look really nice, probably because the first time I saw it was in Silmarillion by Tolkien. It is fun how the things you grow up with kind of becomes so strong in your view of things, never underestimate the power of nostalgia. Ponte Portore is a small town situated on the road between the cities Pietra and Castelli in Truscia. The town is built around the old stone bridge owned by the family Pontesceau. A family that has built it’s riches on the toll fee they take out on the goods passing the bridge. The family themselves don’t reside in town but on a big farm just outside. Legend say that the Pontesceaus sold their soul to the dark gods of the forest. In return the Gods helped them build the bridge and every hundred years the youngest son in the family have to willingly give himself to them. But who believes in legends……. 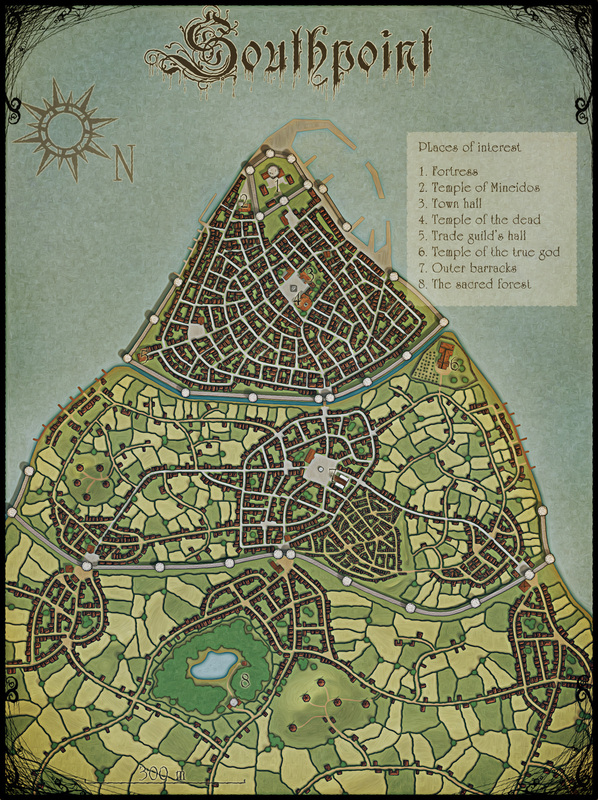 This is a map of the city Southpoint, situated in the southern parts of the kingdom Armadien. The map is done using the same technique as the one I described in my tutorial I ran earlier here on the blog, but on a much larger scale. The map is done in City Designer 3 (CD3) from Profantasy, but edited with various effects in Photoshop after completion in CD3. CD3 is probably my favorite program from Profantasy and I’ve done quite a lot of maps using the program. Mostly small villages and medium sized towns. The programs strength is that it let you create a very convincing town or village in a very short time, compared to if you did everything by hand in a program like Photoshop. It is easy to place houses and trees and there is a great variety of different textures of more “important” buildings you can as easily use. Even if the program in most cases work great there are some smaller drawbacks with it. First and mainly it has a tendency to crash,and usually this happens when you haven’t saved for a long time. Which makes you loose a lot of work. So saving as OFTEN as you can is a must. Also when you use a predefined style the end result tend to be a bit ordinary, that’s why I like to process the maps in Photoshop. To give them a more unique look and feeling. When you create a larger town like Southpoint you need to do a bit more planning of the city then if you’re mapping a small village. When I made Southpoint I started by looking at some older towns in Google earth, which is a great and fun way to spend you time :). In this way I tried to see how I could capture the look and feeling of a town, that would make Southpoint look more convincing and real. When I started on the map I began by creating the landmass and sea. 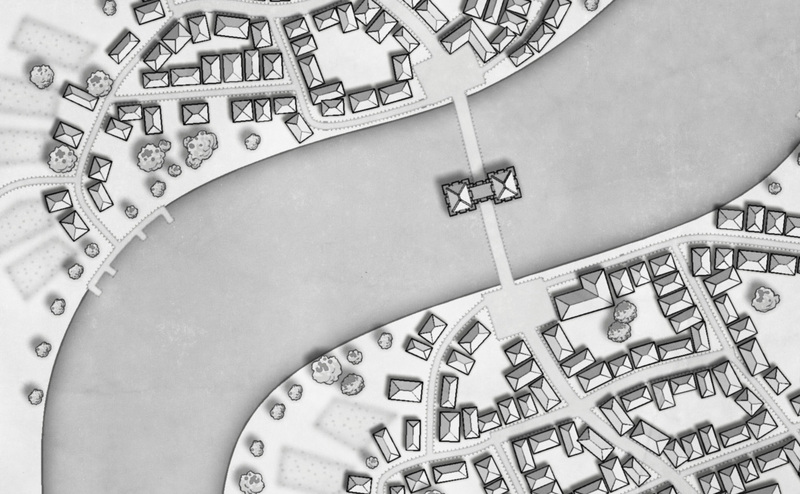 I then decided where to put the inner town wall an designing the streets in the inner more compact part of the city. At this stage I put in the roads that led into town and decided where to put the gates for the outer town wall and how the wall itself would stretch. I now had a inner dens city surrounded by a city wall and an outer city wall with roads leading up to the inner city from the maps lower end. Next step was to try to figure out where people would settle down in this area. usually people start to build houses around the city gates, you need to have a place to stay if the walls are closed and after arriving in the town you might want some refreshment or selling some of your goods. At this stage I also tried to decide what roads will be used more often, because these will be cobbled, where might the squares be situated, any other landmarks I want to put in. A good thing to do here is trying to pretend that you are a visitor to the town. When you enter the city through one of the gates what can you expect to see? Where would you go to look for an inn? Are there any temples near by? In this way it is both fun and inspiring to start building your city, and often I come up with a lot of ideas in this way. So after completing the map and working in the way described here I came up with the following story regarding Southpoint. Southpoint used to be a free city with close connections to the City state Ankh-Bathor further south. But the King of Armadien couldn’t accept it’s freedom (well he obviously wanted part of the money). After some short battles and long negotiations Southpoint agreed to be a part of the Armadien kingdom and pays a yearly tax from it’s vast trading income. A lot of very influential people in the city (mainly traders) don’t like this and want there freedom back. With support from Ankh-Bathor they are plotting against the king. Unfortunately some are also looking for help in the shadows and nightmares where seldom good deals are done. One of the best things that Profantasy has released is in my opinion the Annuals. If you buy Campaign cartographer 3 from the company you get a really great program, but if you want it to shine you really need the Annuals. It’s here that all the gems are hidden, all those great styles that will let you create fantastic maps. So every year I buy the annuals, of course not all months include a style that I want or need, but you always learn a bit or two from the including pdf, that you will get every month. So if you want to become a better mapper with Profantasy’s products I can really recommend the Annuals. This year I’ve decided to try to make a map of all styles that are included in this year’s Annual. So every month I will try to make a map of the included style, as long as it is possible. Some months you don’t get a style from which you can create a map, then it is hard to do a map from it. So this month you got the Overland Satellite style in the annual. I really liked this style, it is very different from the other styles you have in the program, which is refreshing. It also turned out to be a very easy style to work with. The more stuff you put into the map the better it will look. When you start the map I can recommend that you put in some time while creating the coastline of your continent. As you can see in my example the coastline is a bit too straight. I realized this half way through the map, so I didn’t bother to go back and change it. But if I’d start a new map in this particular style I’d try to make it a bit more uneven. I also had some problems with the rivers. For some reason, that I don’t know they always turned out much fainter after having exported them via Cute pdf. In the end I increased the glow on them a bit, which made them OK. But if I decide to make a map in the style in the future I probably will make the rivers in Photoshop. I also decreased the glow you have around the continent, I thought that the original setting was a bit strong, but that is just my taste. I also made the labeling in Photoshop, but the reason for that is mainly that I work so much faster in Photoshop then in Campaign Cartographer 3, so I decided to take the quick path here. 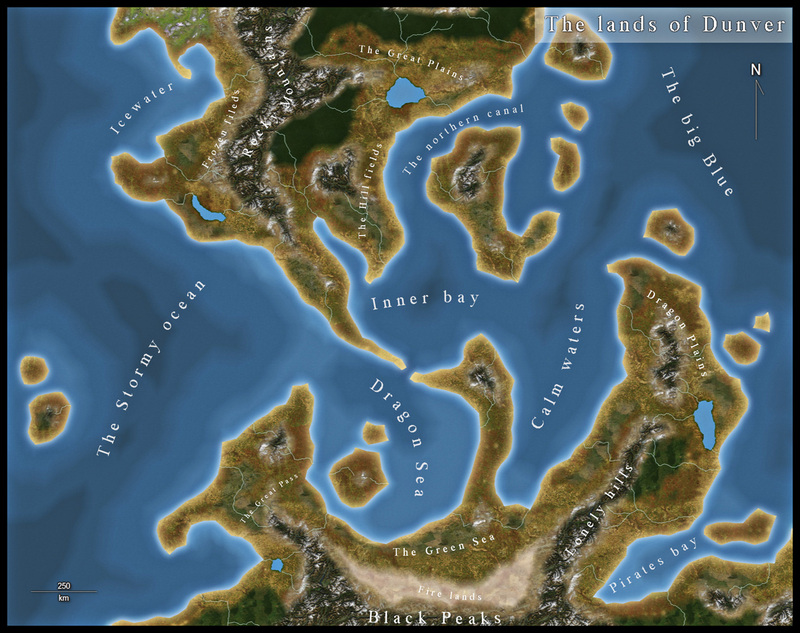 Anyway here is the final result, The lands of Dunver. This is as far as the Etrakien Empire would stretch when it was at its height of its power. In the mountain passes between the Grey peaks and Karpanien the Empire finally clashed with the growing power in the east, Arnoria. In the following war that lasted for one hundred years and brought the people in the area nothing but blood, sweat, death and tears, both Empires would crumble and nearly cease to exist. Today, two hundred years after the end of the last battles in the great war the area is divided into many countries. In the west on the map you have Krug, an elitist country with a society that is very focused on warfare. To the north lies Illyrien, a very decentralized country with strong city states that cooperate to survive against aggressive neighbors in both the north and west. 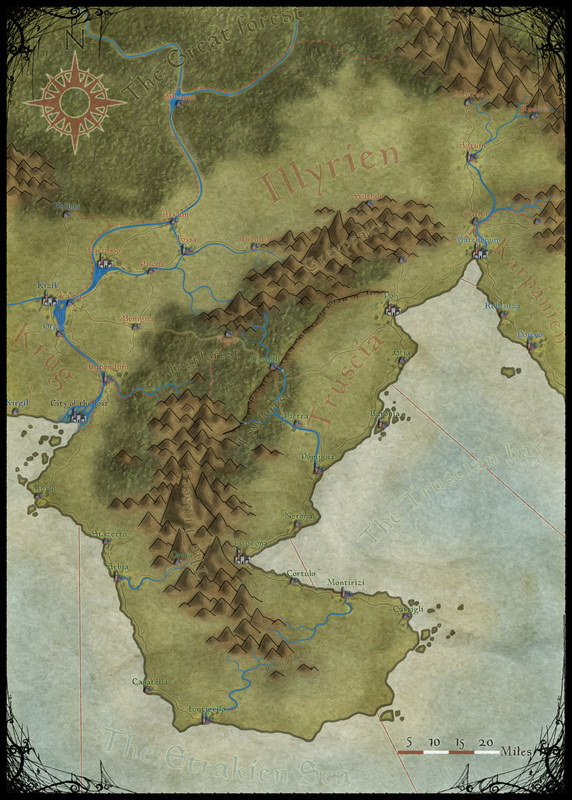 South of Illyrien lies Truscia a more archaic country that still believes in the lost world of the Etrakien Empire. They still have very good relations with whats left of the Etrakien Empire, in contrast to all the other countries in the region. In the east you have Karpanien, a kingdom ruled by a despotic king that dreams of better glorious times but has to struggle with a population that want nothing else but throwing him of the throne. Between Krug and Truscia you also have the City of the Lost, or the City of lost souls as it sometimes is referred as. It is a city in the middle of the river delta, that mostly consist of marsh land, built on top of old ruins from the forgotten past. Here mainly people that don’t belong anywhere, outcasts or outlaws lives. The path to the city is a dangerous one to walk, if you don’t know the secrete paths, and from the sea only a selected few knows how to sail. The map is made in Photoshop, mostly by hand. I like to do my maps by hand, not using that many brushes. I tried to use brushes for the mountains but I never got the result that I was after. When you draw the mountains by hand you can get them exactly as you want and there is no risk of any repetitive patterns. Lucky for me I’ve developed a way to do them rather quick. In my first maps the mountains took forever to do, now it takes me around two days (16 hours) to do a map like the one in this post. And that includes everything. The city icons are however brushes, or not real brushes, I just copy the icons and place them in a new spot, but they are all the same (yes I do have three different versions in the map, one for large cities, one for cities and one for small cities). I’ve also used a paper texture and compass from Coyotemax over at the Cartographers guild for this map. It is really good to use his paper texture as the basis for your maps. It brings more life to the colours, and makes them look more hand painted.